Humour – paperback; Hardie Grant Books; 176 pages; 2004. 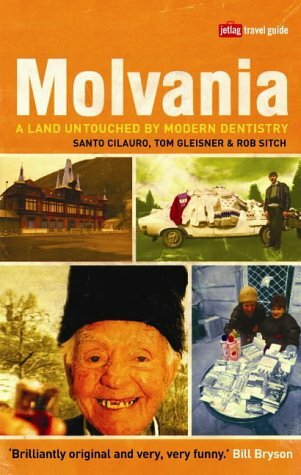 If you are like me and are somewhat addicted to travel guides, be they Lonely Planet, Rough Guides or something similar, you will greatly appreciate Molvania: A Land Untouched by Modern Dentistry. Written by a team of Australian comedians — the same men behind the films The Dish and The Castle and the current-affairs mockumentary series Frontline — this is a spoof travel guide for a fictional nation located somewhere in the Baltic region of the former USSR. In the best travel guide tradition it provides a wealth of advice on places to stay, the best places to eat, the sights to see and intriguing little snippets about the country’s social and cultural history, all interspersed with amusing photographs and illustrations. By turns completely realistic and laugh-out loud funny, it is one of the most entertaining reads I have had in a long while. On every single page there is something that will grab your funny bone and have you chuckling uncontrollably. For this reason, my advice is not to read it in public. It’s also not advisable to read it while you have a friend in the room because you will spend all your time annoying them by saying, “hey, listen to this”, as you regale them with insights from the book, and then, before you know it, you will be reading the whole thing out loud in between bouts of laughter. for years assumed to be a shield, but has recently turned out — upon closer examination — to be the grille from a Fiat 350.
may, in fact, have been painted over a rare, and far more valuable, self-portrait of the Dutch master. Under the curator’s guidance a painstaking restoration process was commenced in which the outer layer of the painting was delicately stripped away. The work took almost 16 months and eventually revealed nothing underneath. With the original work destroyed, all that remained of value was the frame which now holds a copy of Mr Mzecjenj’s letter of resignation. Trudi Dennes: Trudi has lived and worked in Japan for over 10 years. She now works in the department of classical history at Tokyo University. Trudi has never visited Molvania and was assigned to this guide due to a staffing error. My only quibble with this very clever and comical book is that it gets a bit “samey” after awhile. It’s definitely not one to read cover to cover, but one to dip in and out of over an extended period of time. It’s perfect light reading to lift your mood and bring a smile to your dial should you need one. Hey I’ve just been to the Molvania site and ther is a new Eurovision 2005 entry! The song is called “I am the anti-pope”. Zlad unfortunately looks kie he’s been disqualified again! Richie, that is a classic! Thanks for the heads up. Think I will post about this song in my normal blog. Cheers. really had a fit from laughing. couldn’t stop reading. also very much liked the pictures and subtitles to them. but also the superb hotel and dining facilities!